The River Exe was until the 13th century tidal up as far as Exeter; it was the building of Countess Weir by Countess Isabella de Fortibus in 1284 that effectively cut the city off from the sea. The Exe at this time had a wide floodplain that stretched from the city wall across to the rising land of the Haldon Hills. The river through the ages had meandered down this flood plain, moving its course from side to side through the millenia. It was known that the Exe was prone to flooding in mediaeval times and there are records of floods as early as 1250. In 1286, the new Exe Bridge ( a short history) was partly demolished by flooding and again in 1384. In 1625 a large flood caused devastation from Tiverton down to Exeter. The partly completed Georgian Exe Bridge was swept away in 1775 and work had to recommence on a stronger structure. By the 20th century it was apparent that this bridge helped to hold back the flood waters and create flooding upstream. The new, steel bridge completed in 1905 improved the situation slightly, but its design, along with development along the river banks ensured that serious flooding would occur again. 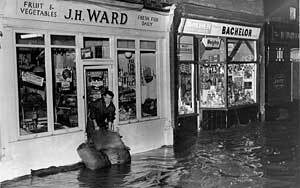 Indeed, there were at least five floods between 1917 and 1952 in Exwick, Cowick Street, St Thomas and other areas to the west of the river. During October 1960, Exeter had in excess of 380mm of rain, half the annual average. 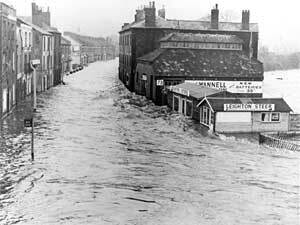 On 26 October 1960, a further 60mm of rain fell over the Exe catchment area causing the river to rise alarmingly. On the next day, the 27th October, or 'Black Thursday', 700 cubic metres of water per second (cumec) rushed down between the banks of the Exe and overflowed the river from above Exwick down through St Thomas and towards the low lying parts of Alphington. St David's Station was flooded on the east side of the river, but it was the western bank that took the brunt of the torrent that day. In Exwick, Station Road acted as a barrier to the water and caused mud, silt and boulders to be swept through the streets - the water depth was as much as 2 metres (6ft 6 inches). A raging torrent flowed on the west side of the railway embankment, over the Exwick playing fields, along Western Road, Okehampton Street, Haven Banks and Alphington Road. The rising ground in front of Redhills Hospital and along Exwick Road and Buddle Lane saved these areas from inundation. Another area that was spared was around Flowerpot Fields, because surprisingly, it is slightly higher than the surrounding ground. The water was deepest in Okehampton Street where almost 2 metres (6 ft) of water raged and roared past the front and rear of buildings. One resident of an upstairs flat in Stephens Buildings, Mrs Louisa Avery said "We were all terribly frightened. You could feel the vibration as the water roared past. None of us could possibly have got out of our homes and we were scared stiff that the foundations would crumble. We went to bed but couldn't possibly sleep." Just before midnight, a Royal Army Service Corp DUKW reached the building and rescued the trapped residents through a window. At the rear of the building a £1,000 worth of coal and coke from a coal yard was washed away. A ground floor resident, Mr J Davey spoke to the Echo "As soon as we saw that the water was getting too deep outside to wade away, we decided to go while we could. We went to the upstairs of my mother-in-law's house opposite and from there we watched the floods surging over our window-ledges. My wife and I carried our seven-month-old baby Julia away with us. We watched last night as the Army DUKWs tried to negotiate the floods, but they had a tough time of it. One of them was swept round and knocked a lamp-post down, and another trying to help it was washed against a garden wall which tumbled over. Some people had to climb through one of the houses and walk through the back to get to another of the DUKWs." Peter Palmer swam through five feet of water to his home, near the Okehampton Street railway bridge, where his mother and younger brother, Tony, were trapped. " I had to let myself float down on the current and grab hold of the wall and work my way until I could get into the house. Then with Tony we took our two dogs, Judy and Tiny, upstairs and left them some food. We dragged ourselves back along the front of the buildings against the current until we reached a shallower part and were able to walk to a bungalow to stay the night." Western Road around Beach Brothers was flooded to a depth of 1.3 metres (4ft 3 inches) above ground level. The flood was so sudden that more than 150 employees were trapped on the first floor of Beach Bros. premises for nine hours before being rescued by an army DUKW at midnight. It was reported that people were walking along the main railway line towards St David's Station as it was above the flooded surrounds. 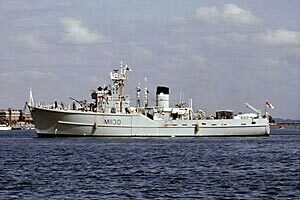 A barrel of beer from the Royal Oak pub in Okehampton Street was picked up by the Royal Navy ship, HMS Highburton on 8th December, seven miles off Portland. This courageous act from the crew was well repaid by the brewery and the barrel was turned into a seat (see link above) complete with explanatory brass plaque, and placed in the public bar of the Royal Oak. Timber, cork and corkwood from Beach Bros was also found floating in the Channel. In total, 2,500 houses, factories, churches and pubs were flooded. Carpets, furniture, electric wiring, shop displays, stock and decoration were covered by a layer of thick, muddy red slime. Along the Alphington Road the flood water reached as far as the Crawford Hotel. Recovering from flooding takes a long time - a house has to be cleaned of the stinking mud and it takes time to dry out before redecoration, which can take many months and it can be expensive if space heaters are used to speed the process. Beach Bros lost a total of £21,488 in the October flooding, and this was a fraction of the loss in Exeter. Five and a half weeks after the October flood, the waters surged back and on Sunday, 3 December a further 80mm of rain fell to swell the river waters and again, flood 1,200 properties. Shops, factories and houses that were recovering from the October drenching, suddenly found that they were returned to the sodden, muddy condition of a few weeks earlier. Beach Bros sustained another big loss, this time to the value of £20,983. Something had to be done to prevent such a catastrophe again. The planners had to make a cost analysis of a flood prevention scheme - it was calculated that a 700 cumecs flood was likely every 50 years. Enlarging the river channel by dredging and raising the banks would ensure that a water flow of 350 cumecs could be managed without flooding. But the October flood had reached 700 cumecs; what do you do to manage such a flow of water? There were five options suggested. 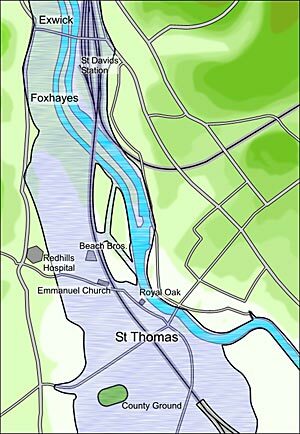 The first was to improve the flow of the Exe and increase the height of the river bank. As already stated, this would not be enough alone. 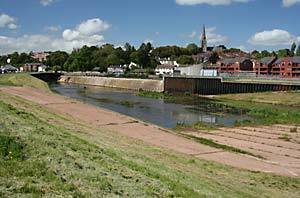 Diversion channels could be built upstream to take the flood waters away from Exeter - one such scheme was to build a channel at Brampford Speke to connect with the river Clyst. However, this posed problems of flooding on the Clyst and many roads and railway tracks would have to be have bridges constructed. The building of storage basins, again upstream to hold the water back was also considered, but finding low lying farm land without railway lines and other structures was difficult. Another idea was to build parallel relief channels along the Exe that would take surplus water in time of flood, and carry it downstream to be discharged back into the river. The last option that was considered, were two 4.6 meter (15 ft) tunnels be dug between Cowley Bridge and Countess Wear. This option would have been a technical masterpiece and would have the least impact on the landscape, but it was hideously expensive. In 1962, it was decided to improve the river channel and build the tunnels. However, after consideration, the tunnels were dropped in favour of building the relief channels along with improving the existing river channel. It was thought that such a scheme would withstand a 700 cumec flow and could be built in stages to spread the cost over several years. A large model was constructed at the Hydraulics Research Station at Wallingford, Oxfordshire and measurements made to ensure that the water flow of 700 cumecs could be managed. In 1965, work started on the scheme by the Devon River Board and over the 12 year construction period the Devon River Authority and then South West Water took over the stewardship of the project. The total cost was £8 million at 1977 prices. And what did Exeter get for its £8 million? Three flood relief channels were built - the first started just above Cowley Bridge for about 1 kilometer, to return to the river at a point adjacent to Exwick Barton, just below Exwick Weir. The Exwick spillway is the largest and technically most complex of the channels - a huge radial gate was built just above St Davids Station that is designed to close water from the river and divert into the spillway that runs from the gate down to the new Millers Crossing footbridge, just above the Mill on the Exe pub. The radial gate is totally automatic and responds to changes in water level - a system of chambers fill with water and floats in the chamber rise with the water and lower a huge gate into the flow of the Exe, thus obstructing the flow of water downstream and causing it to spill over into the Exwick Spillway. The spillway is 1,600 metres long and has grass covered concrete banks and a concrete bottom. It is drained of water and cleaned every year and allowed to fill to a depth of 0.7 meters, allowing it to be used for model boating and canoeing. 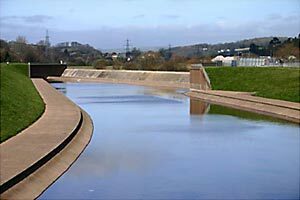 The River Exe and the Exwick Spillway can handle 708 cumecs between them. During the building of the channel in 1974, Station Road and the bridge crossing the Exe were swept away in another flood. It was a year later that the army lowered into place a new bridge. The Exwick Spillway was formally opened by John Silkin on 23 September 1977. A third relief channel was installed just above Trews Weir, close to the entrance to the canal. In time of flood, Trew's Weir Relief Channel will allow water to spill over the concrete weir and flow along the grass covered channel to exit adjacent to St James' Weir. 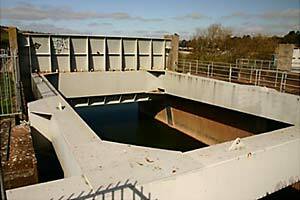 In addition to the flood relief channels, something had to be done about the obstruction of the Exe Bridge. 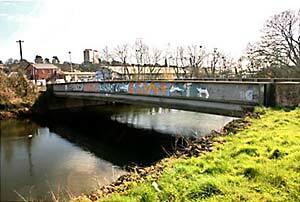 In 1969 and 1972 the two new concrete bridges were constructed and the old steel bridge dismantled. The two new bridges are utilitarian in design and have streamlined piers and a flat underside to aid the flow of water at the time of flood.